The WannaBeatles have played plenty of shows, concerts, dances, festivals and birthday parties, but we had never played for someone's marriage proposal before. This is a story about Kyle and June. 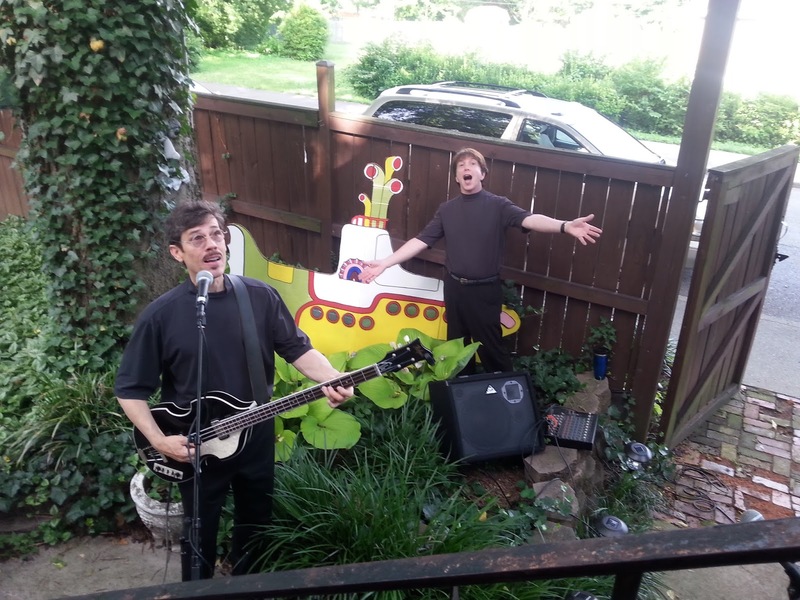 Kyle called us a few weeks ago, wanting to surprise his fiancé with a live band playing her favorite song, which he said was "Yellow Submarine." He had a plan, which was to "pop the question" on the balcony of their house, at exactly 9:00 am, just as we played our live version of the song. The date was Saturday June 13. He gave us the address in east Nashville, and he worked out the details with WannaBeatle Dennis. One problem we had was WannaBeatle David being in Chicago that day, for his son's graduation from college. 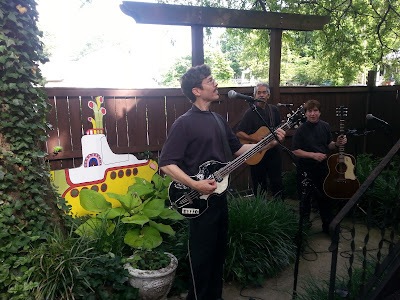 Under most conditions, The WannaBeatles perform only with all four band members, but this was a unique request, and we figured it was possible to do "Yellow Submarine" as a three piece group. Dennis and Kyle discussed how it would be done. 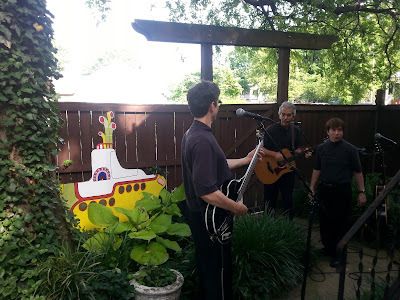 Dennis suggested that we play another song in addition to "Yellow Submarine," something that would fit the occasion (a love song, plenty to choose from) which would also sound good with only three of us playing. After several suggestions back and forth, Dennis and Kyle agreed on "Do You Want To Know A Secret," which was appropriate in more ways than one. 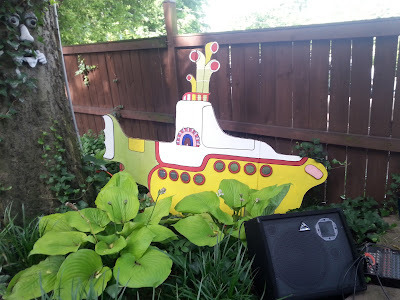 We spent some time thinking about the setup - whether to use Nathan's keyboard or bass (there are plenty of keyboard sounds on "Yellow Submarine",) how elaborate our PA system should be, where to set up our cardboard yellow submarine prop, whether to play electric or acoustic guitars, etc. 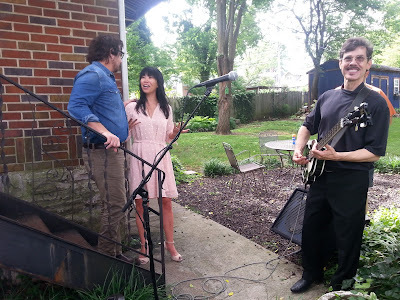 We rehearsed our "Threeatles" version of the song, covering for the lack of drums by my banging on the acoustic guitar to simulate the kick drum part in the first verse. 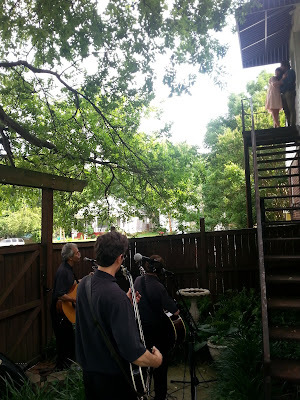 When the day came, our main challenge was getting all set up for a 9:00 am performance, while being quiet enough to keep the secret from the person in the house who was being surprised. 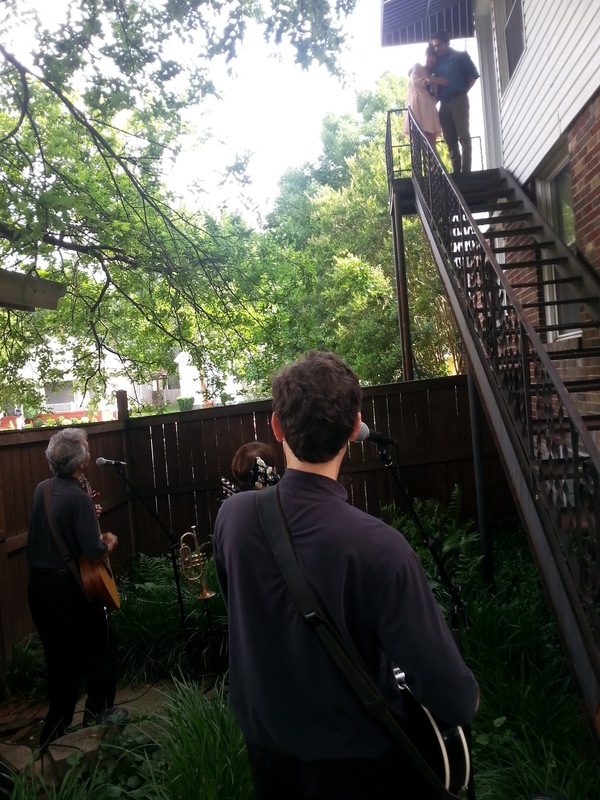 We were actually set up by 8:25 am, and were being very quiet in Kyle's back yard. Dennis suggested we go out and have coffee. 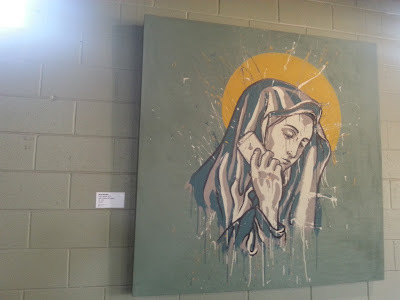 We tried nearby Ugly Mugs, but there was a line of about a dozen customers waiting, so we drove a few blocks over to Bongo East, where we got quicker service, and enjoyed some wacky artwork on the wall. We were safely back at Kyle's backyard by 8:50. At approximately 8:55, we saw Kyle step outside his back door to give us a signal. He raised both hands with all fingers extended, to indicate "ten minutes," i.e. a slight delay in the exact start time. We knew we had to be flexible, with something like a marriage proposal being orchestrated while the recipient of the proposal remained unaware of the event. And so, with the final go-ahead, we started "Yellow Submarine" at 9:05, and out walked Kyle and June, the lovely lady dressed in a filmy pink dress and high heels - looking pretty sharp for a Saturday morning. She had a look of shock on her face, as we went through the entire song, the two of them watching from the top of the stairs. Then, Kyle did his thing: got down on one knee, holding her hand, and asked the big question. She said yes. We didn't get that official news until we'd finished "Do You Want To Know A Secret," and met Kyle and June for the first time. 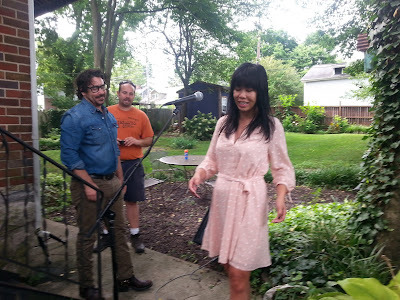 It turns out they both live in Chicago, and were only in east Nashville temporarily. Kyle has been working in the advertising business, so staging an event like this was right up his alley. We were very impressed with Kyle's creativity, and his obvious love for his lovely bride-to-be. 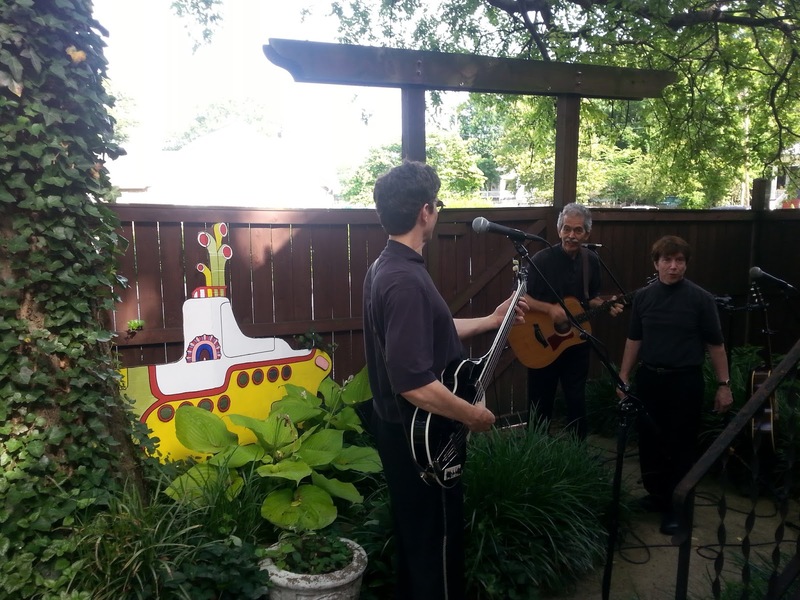 The WannaBeatles were very happy to be involved with such a personal, romantic, and unique event, celebrating a moment of a lifetime, accompanied by a couple of well-chosen Beatles songs to bring delight to an east Nashville backyard on a Saturday morning. The WannaBeatles, in our continual exploration of Beatles history, come across some interesting facts along the way. October 1492 - Columbus discovers America. July 1776 - Declaration of Independence. February 1964 - Beatles on Ed Sullivan. And that appearance on Ed Sullivan sparked a record-breaking flurry of Beatles hits, starting with "I Want To Hold Your Hand." After seven weeks at number one, it was replaced by "She Loves You," number one for two weeks. Then came "Can't Buy Me Love," number one for five weeks. America was in love with the Beatles. And then, the inevitable: the streak of number ones was broken. 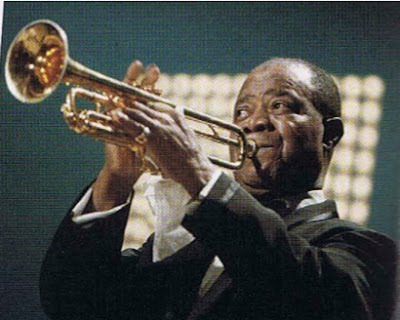 On May 9, 1964, the first record to replace a Beatles song at number one was another record breaking artist and song - Louis Armstrong's "Hello Dolly." It was Armstrong's first number one, and set another record for the oldest artist to hit the top spot. WannaBeatle Nathan has been working at Temple Baptist Church for much longer than he's been a WannaBeatle. Working there, he met local trumpeter Freddie Holt, who happens to do a Louis Armstrong impersonation. Our annual show at Crockett Park is our opportunity to try something different. Last year we invited a choir from Christ Presbyterian Academy onstage with us to perform a Beatles medley. 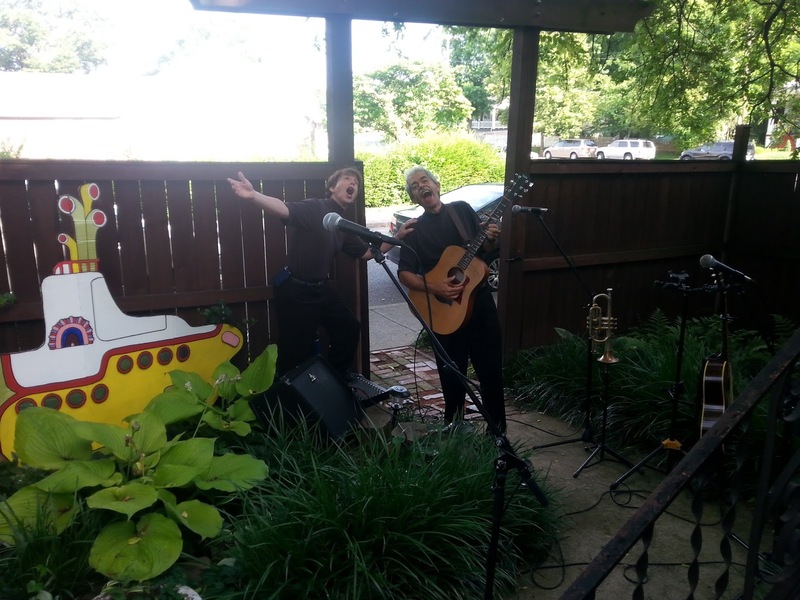 We also had Buddy Burris and Brenda Morley from the Nashville Brass Band playing trumpets with us on "Magical Mystery Tour." The year before that we had American Idol finalist Rachael Hale sing with us. Nathan suggested Freddie as this year's featured guest. We asked him, and he accepted. So we've been rehearsing "Hello, Dolly," with WannaBeatle Dennis doing his magic by playing the banjo part on his MIDI-equipped guitar. It's nothing like a Beatles song, but it's totally fun to play. The collision at the top of the charts, in hindsight, seems like a beautiful gesture by Fate. 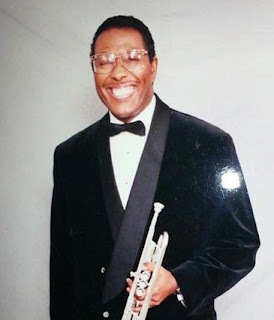 In terms of lasting influence, Satchmo (Armstrong's most famous nickname) and The Beatles are probably the two most significant musical forces of the twentieth century. No one expected Armstrong to hit the top of the charts in 1964, but it became a great reminder of his contribution over the previous four decades. It would be impossible to trace the history of jazz without his seminal work of the 1920's and 30's. In a sense, Louis Armstrong represents the birth of American music, as a distinct idiom. And it would be impossible to imagine The Beatles emerging without the rock'n'roll music of the 1950's which inspired them. What connects the two is the lesser known story of how jazz prepared the way for rock. The connection from Charlie Christian to Chuck Berry is not hard to follow, for those who care to trace the lineage. We can leave that discussion to the scholars. What The WannaBeatles have before us is a wonderful song to play, and a great way to remember the guy who knocked the Beatles off the top of the charts. Our Crockett Park concert is June 28. Bring a picnic blanket, and a cooler with some New Orleans food.